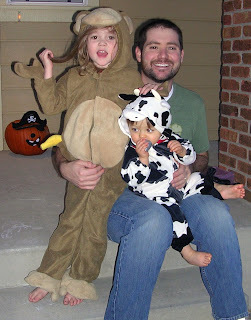 Making Life a Bliss Complete: Halloween-a-palooza! WOW! 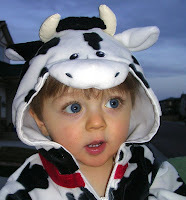 Checking everyone's blogs the day after Halloween is almost as good as Christmas morning! There were such great pics from both the Murdocks & Higginbothams, I thought I'd post a few to share all around! Isaac the Alligator and Kenzie the Puppy. (using fudge-striped cookies and Hershey's kisses). 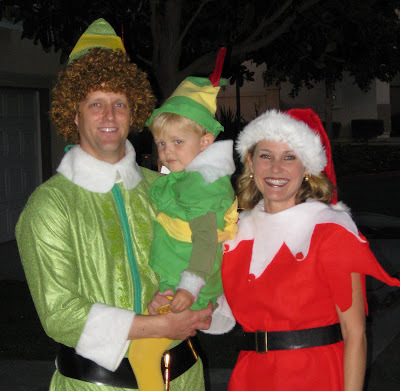 Marc as Buddy, Ann as Jovie, and Jake as Papa Elf! between Marc, Halloween and increased body hair. The Elf crew, Kate the Pirate, and Truman the Storm Trooper. (he wore a sign on his back that said "Follow Me!"). Mer constructed this from a diaper box. This costume was months in the making! LK with her ruby reds--Mer glued the sequins on by hand! Tessie has the MOST FUN FAMILY EVER! These photos made my day! Almost as good as Halloween (my high holiday) itself. Mer, I love, love, love the costumes you made. You are a woman after my own heart. A friend once accused me of "Halloween overkill"--and told me I was the kind of mom who would make an Eiffel Tower out of paper clips for one of my kids! (duh, like, who wouldn't!). Tessie is the sweetest cat on earth--right next to her Siamese mom. And Ry, you did the family right proud with your awesome jack-o-lantern. I'm proud of all my Halloweeners. . . Long live the family tradition! How cute you guys! I love those witch hat cookies. I'm all for a treat that looks cute AND tastes good. Yum! 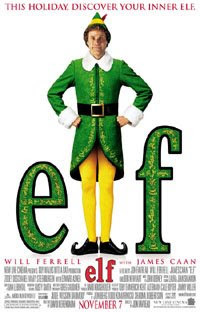 Brian's favorite movie is "Elf". He's gonna be pretty jealous when he sees that. And Wendy and Keith? I'm assuming Miriam just hasn't posted the pics yet because I'm sure they had great costumes to celebrate Halloween/birthday, yes? How did I get so far behind on all your posts???? 1.Love the spooky tiger! Those cupcakes look delicious! 2. You look beautiful!!!! In your makeup shots and in your cat costume! You always were beautiful! 3. So fun to see everyones costumes. I may have to steal some ideas for next year! :) Or maybe I should do a contest for the most creative idea for us! Sorry, Josh! 5th grade--you're an even bigger saint than I thought you were! 3rd grade is my favorite. It must have been 3rd for his student teaching? I guess he wouldn't be in mom's school if he taught 3rd, huh? Give the toothy alligator and spunky puppy kisses for me! It's been 5 days without a Tess update! WE WANT TESS! Miriam, you're STILL reading Edgar Sawtell? Yawn.